Coventry is a city in the West Midlands area of England. As of the 2001 Census, it had a population of 303,475, making it the 9th most populous city in England, and the 11th most populous in the UK. 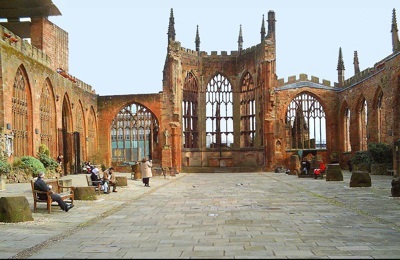 During World War II, Coventry was heavily bombed (including most famously the destruction of the Coventry Cathedral). During World War II, Coventry also became the world's first city to form a twinning relationship with another city, when it was twinned with Stalingrad (today known as "Volgograd") in Russia. After World War II, as a gesture of reconciliation, Coventry was also twinned with Dresden, Germany, which was of course also bombed during the war. Coventry is a city in the West Midlands region of England. It is the 12th most populous city in the United Kingdom, and the second largest in the West Midlands region (after Birmingham. Coventry is home to two universities: Coventry University and the University of Warwick. The British English idiom of saying "sent to Coventry" refers to ostracising or deliberately ignoring a person. The origin of the phrase dates back to the English Civil War (1642-1651), when Royalist prisoners held in the city were so despised by residents of the city, that nobody spoke to them. In the 18th and 19th century, Coventry was a center of watch and clock manufacturing. in the 20th century, the city became a center of automobile, motorbike, aircraft, and machine tool manufacturing. Since the 1970s however, the British motor industry has been in gradual decline, and Coventry suffered as a result. During World War II, Coventry suffered severe bomb damage inflicted by the German Luftwaffe. In the 1980s, partly as a result of high unemployment, and economic difficulties, Coventry suffered high crime rates. However, the growth of new industries has revitalized the city, and crime rates have now significantly fallen. In the post war period, Coventry has attracted a large number of Asian and Caribbean immigrants. One of Britain's first mosques was opened in Eagle Street Coventry in 1960. This stunning Coventry (UK) travel journal is the most essential accessory for every travel and adventure lover, as it will help you express yourself and get lost into this whirlwind of new destinations. Take a look at the Coventry (UK) map, find your way towards adventure and lose yourself to unknown destinations because you only live once, so why not live your life to the fullest? Coventry is a brilliant city! Which begs the question, why not create your own city guide and keep a travel journal to help make your time there unforgettable, fun, and organized, eh? You hold in your hands a journal and city guide re-invented for listmakers, curators, travelers, urban explorers and city locals alike! This notebook can help you keep all your important information about Coventry organized and ready for when you need it and where you need it. Use the pages of this notebook to document your adventures, experiences, thoughts, and memories. Have fun making lists of all the highlights and lowlights Coventry has to offer. This is the perfect place to journal your time with boots on the ground in Coventry! This is the perfect place to write down and organize everything you find fascinating about the city — which is why it's your diy city guide. Make your time in the city more fun, more organized, more productive and more creative by making Coventry DIY City Guide and Travel Journal: UK City Notebook for Coventry, England your newest and trustiest sidekick.